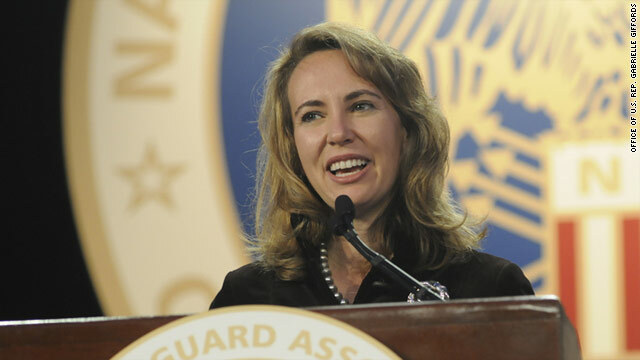 U.S. Rep. Gabrielle Giffords was shot in the head on January 8. Editor's note: Don't miss "Dr. Sanjay Gupta Reports: Saving Gabby Giffords," on Sunday, May 8 at 7 p.m. The documentary reveals exclusive detail of the extraordinary efforts by paramedics and doctors credited with saving the life of the congresswoman. You can also join Dr. Gupta for a LIVE chat on Twitter during the program. (CNN) -- In January, a bullet fired from point-blank range tore through her brain. Just last week, she was seen walking, albeit with effort, up the stairs of an airplane. Arizona Rep. Gabrielle Giffords is making a remarkable recovery after a gunshot wound to the brain, doctors say. Her case shows off the brain's capability to restore some functions after substantial injury, a phenomenon called "plasticity" that is helped by rehabilitation. "It's still a relatively new concept," said Dr. Sanjay Gupta, neurosurgeon and CNN chief medical correspondent. "The brain was once thought to be completely immutable" or not capable of change, after childhood. Gupta's one-hour documentary "Saving Gabby Giffords" premieres Sunday, May 8, at 7 p.m. ET. "I'm still amazed from time to time at how well people do, and I think that we have simply underestimated the resilience and regenerative capacity in the human brain," said Dr. Stephan Mayer, professor of neurology and neurological surgery at Columbia University, who has not treated Giffords. Scientists use the term "plasticity" to generally refer to the brain's ability to change. We know now that it is possible to form new brain cells called neurons even in adulthood. By doing rehab to relearn basic tasks, a traumatic brain injury patient may be able to form new brain connections that allow him or her to move and talk again. How well the patient recovers depends on the severity of the damage, but substantial progress can be made in some cases, doctors say. Every year about 1.7 million people suffer a traumatic brain injury in the United States; of them, almost 80% get treatment and leave the emergency department, according to the Centers for Disease Control & Prevention. Historically, when people had severe brain injuries and went into semi-comas or comas, they died before any brain recovery because there wasn't life support, Mayer said. In the 1960s, ventilators and cardiac life support helped keep people alive longer after brain injury, but for a long time, most doctors still didn't believe patients could regain much function, he said. "We're now sort of entering an era when we realize the brain is not that different from the rest of the body" in its ability to heal, Mayer said. Although parts of the brain may be damaged, destroyed or even missing, remaining parts can learn how to take over the functions that were lost. This may be how someone like Giffords can recover her ability to do basic tasks such as walk, however slowly. How can the brain do this? It turns out that brain cells called neurons that are next to damaged brain areas can reconnect pathways between other neurons, forming new circuits that can resume some of the lost function. The smaller the lesion, the better recovery is expected in this way, said Dr. Bradford Thompson, director of the Division of Neurocritical Care at Rhode Island Hospital in Providence. Alternatively, so-called "mirror neurons," located on the opposite side of the brain from the damaged area, can become involved in roles that the injured region used to have, he said. For instance, an injury to the left hemisphere of the brain, which in 95% of people controls the capacity to understand and generate language, doesn't necessarily mean the patient can never have a conversation again. That's because the right side of the brain can take over some language functions. This is seen sharply in patients who can sing, but can't otherwise speak. In fact, scientists have demonstrated that stroke patients can learn to associate words and phrases with melodies,, which can help with communication. There are also slightly different circuits involved in speaking on the phone and talking to someone face-to-face. That means that in rare cases, a brain injury could damage one of these abilities more than the other, leaving the patient more fluent on the phone than in person, Thompson said. In younger patients, the brain has greater plasticity and capability for recovery of functions. For instance, children with severe epilepsy that doesn't respond to medication sometimes undergo a procedure called a functional hemispherectomy, wherein the nondominant half of the brain is removed. That might sound drastic, but in 5-year-olds, whose brains are still actively growing, the remaining part of the brain can reorganize itself to control some functions that the missing half would have governed, although the child will probably not be completely neurologically normal, Gupta said. The flip side of plasticity is pruning. Brain areas can shrivel away if they are not being used. When it comes to using your limbs and other basic functions, it is basically a "use it or lose it" situation, Gupta said. If you don't use your right arm, for instance, the part of the brain corresponding to its usage will deteriorate, Gupta said. That's why rehabilitation to relearn how to move limbs and speak again is so important. Doctors also used to believe that damage to the left side of the brain would always result in poor quality of life, and many surgeons would let patients with left-side blood clots or damage die, Mayer said. Today, it has been established that patients report equal quality of life on average regardless of whether the damage was in the left or right hemisphere of the brain, Mayer said. The right hemisphere regulates emotion and visual-spatial function, which is important, too, and isn't necessarily more or less valuable than the left side. The goal of rehabilitation is to stimulate the brain to re-form lost circuits. In order to take advantage of the brain's plasticity, the patient must be placed in an environment where he or she is challenged constantly, Mayer said. "You need to be really actively engaged. You need to be working hard on trying to get back," Mayer said. Of course, that doesn't mean the patient will ever be exactly the same as before the brain injury. Mayer has not treated Giffords, but based on what he knows of her case and those like hers, he expects she'll always have some kind of speech difficulty, and possibly some weakness on the right side. "The more you improve in the early time period, the more you'll improve in the long run," Gupta said. In some cases, a few years after a traumatic brain injury patient begins the recovery process, he or she says that life is actually better than it was before. "A certain kind of person develops a profound appreciation for life that maybe we all lose sight of sometimes," Mayer said.